A year or two out from the fracas that greeted the Wellington Airport proposals for the new International Terminal, its interesting that it has got very little commentary while it is under construction. Are the print media being kept on a short leash? Or is it just that everyone is waiting with trepidation, and anticipation? Whatever the reason, it must be time to have a quick peak. The first thing to note of course is that it is damn difficult to actually see the “Rock” as it is called. It hides behind fences, huddled below roof levels, and behind existing buildings. I wouldn’t be surprised if the majority of users of the airport never notice it at all – because they’re Domestic, and unless you’re on an international flight, that means that you cannot physically see this baby from anywhere inside the main terminal. And not many places outside the terminal either. And, let’s face it, seeing as we only fly to Oz and to Fiji / Raro etc out of Wellington, then you’re not going to see much of the inside yet either. Which is frustrating as anything, because I’m growing more and more enamoured of this strange, mis-shapen rocky thing growing on the coast. The copper cladding is coming along well, and looking fantastic – its defintely not looking like any member of the vegetable family you might care to name. Not necessarily that rockish yet either – unless it is like Martha’s Mine in Waihi, turned inside out. Hmmm, coming along, well, in an interesting manner, methinks. This edge here looks very spiky and suitably rugged for a Wellington south coast, and it will be interesting to see how the sea salts affect the colour. Will this be the first fruit to go from brown to green? We’ll keep watching. And maybe book a trip to Rarotonga in September, because I’m dead keen to find out what is inside. I’m really over the planned-building vox pop, where some member of the public opines that the structure “looks like a giant [object which is not a traditional NZ bungalow or tower block]. Is it really so terrible for a building to eschew straight lines? On the other hand, I’m also over buildings that symbolise things too much. 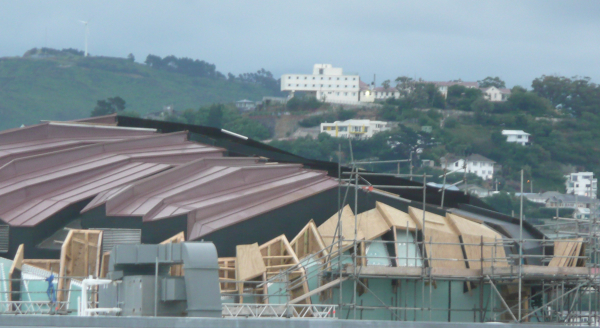 This one is doing the traditional NZ trick of making the building look like the part of the natural environment that would otherwise occupy the site – or at least we like to think it would. But I really dig the jaunty angels and the sheer size of it. We can perhaps pretend the building looks like a giant rock and/or pumpkin, but really it’s a crazy bold-arse airport terminal. I suspect that your naming of the building as a “crazy bold-arse airport terminal” may go down as the best description yet…. I’m also hanging out for the verdigris – weren’t the nikau palms by the library building meant to do the same thing? Does it depend on what grade of copper is used? Criminy, there’s never a metallurgist around when you need one..